Beauty and the Beast is my favorite of Disney’s modern animated films. It’s a contemporary classic that’s been adapted for the stage and enjoyed a successful, long-running Broadway production. It’s a big, colorful show that’s well-suited for a large venue like the Muny. With a cast of well-known Muny veterans as well as some welcome new faces, this production is thoroughly entertaining and true to the magical, enchanting spirit of the film. The plot, based on the age-old fairy tale, will be familiar to anyone who has seen the film. Belle (Kate Rockwell) is a well-read young dreamer who is praised for her physical beauty, but criticized for her unconventional ways in her small French village. She’s pursued by the vain but good-looking Gaston (Nathaniel Hackmann), who seems to only want to marry Belle so he can add another trophy to his collection. When Belle’s father, the eccentric inventor Maurice (Lenny Wolpe) gets lost in the woods and wanders into an enchanted castle, he’s imprisoned by the Beast (Nicholas Rodriguez), who is under an enchantress’s curse. When Belle makes a deal with the Beast to save her father, the story really gets going, as their relationship is the key to breaking the spell that binds the Beast and his household servants, who have all been transformed into objects–like the candlestick Lumiere (Rob McClure), the clock Cogsworth (Steve Rosen), the teapot Mrs. Potts (Marva Hicks) and her son Chip (Spencer Jones) the teacup. There’s also feather duster Babette (Deidre Goodwin) and wardrobe Madame de la Grande Bouche (Heather Jane Rolff). A few changes have been made from the film version, mostly to make the story work better on stage, and a few new songs have been added, including the excellent ballads “Home” for Belle and “If I Can’t Love Her” for the Beast. The film’s classic songs including “Belle”, “Gaston”, “Be Our Guest” and the classic title song are all there, as well. This is a big, vibrant production designed to fit the Muny’s massive performance space. Although the costumes, designed by Robin L. McGee, seem a bit overly cartoonish at times, the set is spectacular. Designed by Robert Mark Morgan, it’s a big, versatile set focused for much of the production on the castle, with a suggestion of the grand stone facade including arches, a staircase and prominent fireplace. The Muny’s turntable is put to excellent use as well, making for smooth scene changes and maintaining the show’s grand atmosphere. There’s also excellent video design by Matthew Young, and some well-placed special effects including real fireworks in a key scene. Again, as has been happening in every show so far this season, there are a few sound mishaps, with mics cutting out and lines being missed as a result. Still, the show is a scenic wonder, contributing to the overall fairy tale theme with style. The performances are strong all-around, with the biggest standout being Rockwell as a thoroughly convincing Belle. She’s got just the right amount of earnestness, determination and likability, as well as a big, powerhouse voice that’s well showcased on songs like “Home” and “A Change In Me.” She’s paired well with Rodriguez as a particularly sensitive Beast, and their scenes of getting to know one another are real highlights. 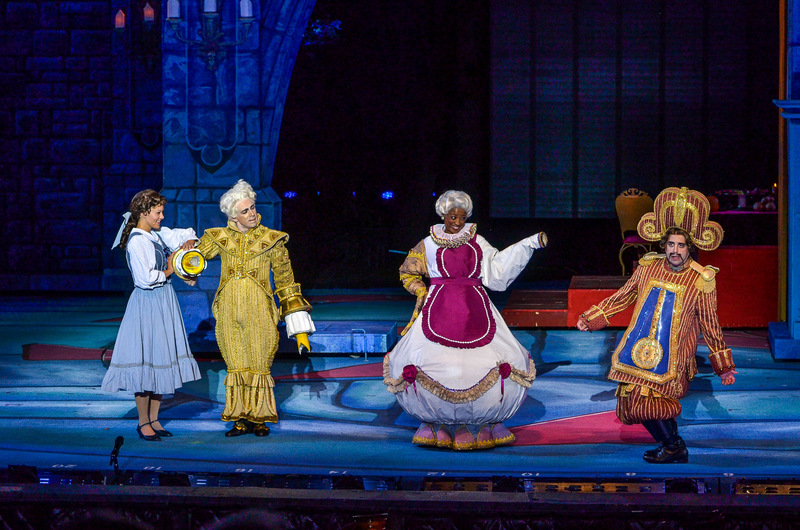 The “Beauty and the Beast” number is beautifully done, with Rockwell and Rodriguez bringing the romantic energy and Hicks in fine voice as Mrs. Potts. There’s great comic support from the always excellent McClure as the charming Lumiere, and Rosen as the fastidious Cogsworth. Hackmann is a suitably swaggering and clear-voiced Gaston, and Michael Hartung is funny as his bumbling sidekick Lafou. There’s also an excellent, extra-large ensemble bringing verve and vigor to the production numbers like “Be Our Guest”, “Gaston” and “Belle”. There are a few somewhat jarring changes from the film that I’m not sure play particularly well, especially toward the end when Gaston confronts the Beast, although the overall conclusion is still effective. The overall charm of this show comes across well in that big, bold Muny style. It’s an entertaining iteration of a classic, and it’s sure to bring joy and enchantment to theatregoers of all ages. 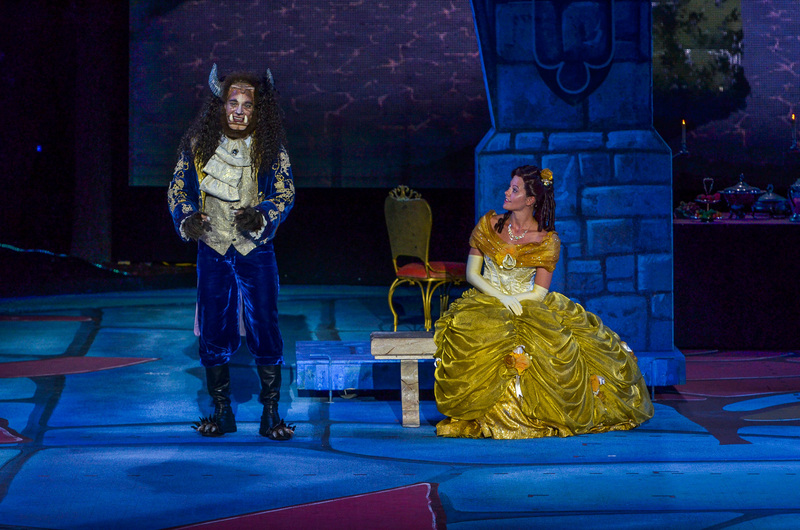 Beauty and the Beast runs at the Muny in Forest Park until August 7th, 2015.